With reference to Deputy Commissioner, Nagaon's Advertisement No. NRA. 15/2018/5, dtd. 15/03/2018, for recruitment of Junior Asstt. 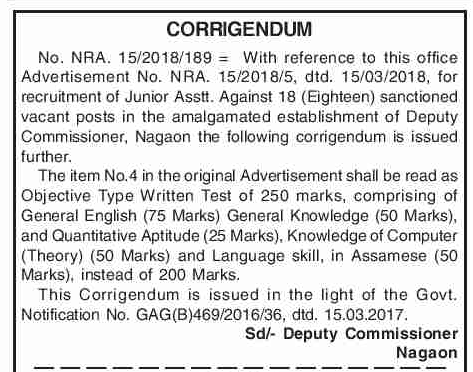 Against 18 (Eighteen) sanctioned vacant posts in the amalgamated establishment of Deputy Commissioner, Nagaon the following corrigendum is issued further. The item No.4 in the original Advertisement shall be read as Objective Type Written Test of 250 marks, comprising of General English (75 Marks) General Knowledge (50 Marks), and Quantitative Aptitude (25 Marks), Knowledge of Computer (Theory) (50 Marks) and Language skill, in Assamese (50 Marks), instead of 200 Marks. This Corrigendum is issued in the light of the Govt. Notification No. GAG(B)469/2016/36, dtd. 15.03.2017. Official Advertisement : Click Here .